instrumental students or nonplaying members, all of whom are selected by competitive audition in the spring of the preceding year. The pit crew is made up of non-performing students who apply to participate in band during the fall and act as equipment/prop movers and occasionally as extras in performances. 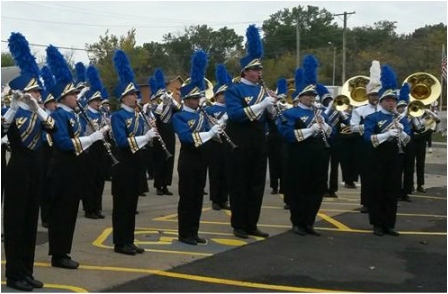 The marching band performs at all home football games and competes at festivals throughout the season. The band travels extensively and has competed twice at both the Cotton Bowl Festival in Dallas, Texas and the Bands of America Grand National Championships in Indianapolis, Indiana. 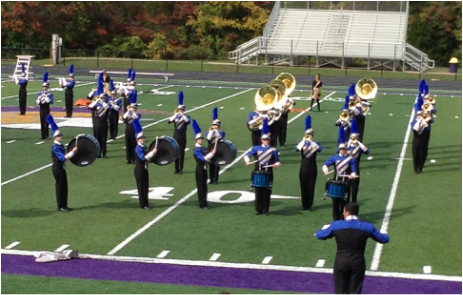 The band has also participated at competitions in Oklahoma, Illinois, Kansas, Tenessee and throughout Missouri. The marching band has a rich tradition of excellence and has been extremely successful in the competitive arena. A listing of awards the band has received is included on the awards page.